MagicPoopCannon is one of the top-rated traders on TradingView. I do not follow MagicPoopCannon and I have not viewed many of his ideas, but the ones that I have viewed throughout 2018, show good grasp of the basic fundamentals of trading, but there are a lot of nuances in trading that they seem to miss in their general charting and reading of indicators. In order to complete this task, I will be using MagicPoopCannon’s idea as an example of how certain common flaws/mistakes in trading logic can lead to a dangerously inaccurate reading of a chart, potentially resulting in serious money loss. The idea posted above will serve as the subject for our analytical critique. The chart above is a Bitcoin price chart on the weekly resolution. The data points are from the ‘BraveNewCoin Liquid Index’. This is a reliable index and one that contains a wealth of data, so there’s no problem there. However, there are a host of other problems in his post that I’m going to take the time to isolate and identify below. Everything that he wrote about the 200-MA is problematic and wrong. To start with, the use of a simple moving average in this context is foolish, at best. Since he is on the weekly resolution, every data point of the simple moving average will reflect the average of Bitcoin’s price over the previous 200 weeks (hence the 200-MA for 200 moving periods). As we all know, just three years ago, the price of Bitcoin was as low as $180 (circa 2014). At its height in 2017, it reached approximately $20,000. Thus, a simple moving average will more than likely show inflated values in the earlier portions of the curve that are not really indicative of Bitcoin’s price action and could even lead traders to believe that Bitcoin is performing better than what it really is. Instead, MagicPoopCannon should have used the exponential moving average. Why? Well, the reason is evident in the very definition of the exponential moving average. Thus, this situational analysis provides the perfect opportunity for one to use the exponential moving averages (EMA) rather than basic moving averages, because the EMAs provide more weight to latter price movements rather than an equally distributed weight throughout. Perhaps if MagicPoopCannon were looking at the 12-period SMA on the daily or hourly resolutions, this would make sense. But in this case, Bitcoin’s exponential increase simply skews the data too much for a favorable reading to be made. As you can see in the chart above, there is a significant difference between the EMA-200 and the MA-200 on the weekly resolution for Bitcoin. The EMA-200 is the blue line and the MA-200 is the dark purple line. The EMA-200 is currently stationed at a value of $4,176.50 for this current period, and the MA-200 is currently stationed at a value of $3,221.30. The analysis of the chart via the EMA-200 on the weekly resolution would also be completely different as well. If we just isolate the EMA-200, as shown below, then we will come to the pretty clear conclusion that Bitcoin definitively broke below the EMA-200 on the weekly resolution before eventually rising to test it again as a resistance (that it failed to break) before continuing lower. Price breaks below the EMA-200 the week of November 19th. That’s fairly major (although it may not be, we’ll discuss this soon). After the price does break below the EMA-200, which was holding as a support before it failed, the price re-tests it as a resistance point. What I wrote in #2 is probably the most significant part and its why I’m a huge fan of bitqueenBR as a trader (she’s in the Discord for those that don’t know; excellent trader). Part of what makes bitqueenBR so successful as a trader is the fact that once the price breaks a support/resistance point, it often re-tests that area before continuing on its trajectory. For example, if the price of an asset/crypto falls below a support point, it will often ‘bounce’ back up and ‘re-test’ that support point as a resistance before continuing lower. Similarly, if the price of a crypto/asset rises above a resistance point, there is sometimes a brief decline or drawdown to re-test that point as a support. Most of the time, if the re-test holds (i.e., the price does not cross back over the resistance/support point), its a major confirmation that the price will continue in that direction. As we can see, throughout the better part of 2018, $7.2k served as a pretty reliable support point with the exception of a couple of drops. Now, keep in mind that the re-test does not happen all time or even often; but when a re-test does occur, you can rest assured that it is a major sign of continuance. Also, for the record, the price has not risen back above $7.2k since this failed rally. By failing to account for the EMA-200 and instead opting to rely on the MA-200 on the weekly resolution for Bitcoin, MagicPoopCannon has painted an exaggerated bull scenario that investors may be tempted to believe if they are not careful. As mentioned in problem #1 for MagicPoopCannon’s chart, there is not a lot of price data for Bitcoin. Fortunately, there is enough for us to take a look at the weekly resolution and make some inferences, but we don’t really have enough information to overlay 200-period MA indicator of any sort. I know that I provided an analysis/reading of the EMA-200 on the weekly resolution in the above problem, but that was merely to show the dramatic difference in the readings of these indicators. Overall, however, neither indicator should be considered to be too reliable (they aren’t entirely unreliable either) because Bitcoin simply has not existed long enough for us to see how the price has interacted with a 200-period moving average on the weekly resolution. Remember, since the MA-period is set to 200, that means that every period (data point) is a cumulative average of the previous 4-years! Bitcoin has only been trading on exchanges with legitimate volume since 2010 (Source: https://99bitcoins.com/price-chart-history/). We can see this reflected in the lines on the literal graph as well. Its not just the lack of sufficient data points that is an issue here, though. We also have not seen how the price has really interacted with either of these MA indicators to really get a sense for how much of an impact this specific MA-period has. In the chart above, I have the EMA-50 overlaid on the Bitcoin price chart on the daily resolution. The boxes in the chart above signal all the times that the EMA-50 has served as a support/resistance. The benefit of having this information is that we can verify that the EMA-50 serves as a significant point of resistance/support at all points in time. This is partially true. However, certain MA periods have a greater impact on the price than others. The same is true with the types of MA indicators used. As we can see in the chart above, the price does react with the MA-50, treating it as a support and resistance at various times. However, there are only 7 major occurrences of this happening throughout 2018 versus the 10+ times that we identified the _EMA-_50 serving as a major point of resistance/support on the daily resolution. This may seem nitpicky, but it isn’t at all. It is important to run backtests like this on the data to get an idea of how reliable an indicator has been in the past (while accounting for any potential ‘smoothing’ or re-painting by TradingView where applicable). With us only having one reliable data point in Bitcoin’s entire price history where the price has interacted with these moving averages, we certainly can’t make any greater inferences as to how significant the bounce is. This is a frequently overlooked feature of TradingView by a lot of traders, but it is absolutely imperative that you remember to switch your chart setting to ‘logarithmic’ whenever you are looking at historical price data for Bitcoin or any other crypto asset that has seen a massive fluctuation in value. I could go into a long-winded explanation about this, but the easiest thing to do would be to show you all. If you’re confused about why I did this, I’ll explain very soon. Just bear with me. For now, let’s focus on the chart. The most important thing to note about the chart is that it only goes up to April 22nd, 2018, and it is also on the regular (not logarithmic) setting. Now, on the next graph that you see below, I’m going to draw a downtrend resistance line that connects the highs. In the chart above, it looks like Bitcoin had broken its long-term downtrend resistance toward the middle of April. Indeed, many in the crypto community were looking at this very chart as a definitive sign that the bear market had ended and that Bitcoin would soon reverse course. In the chart above, I didn’t change anything except for the scale of the chart to logarithmic instead of regular. As you can see, the line that we drew previously is entirely skewed at this point. Now let’s go ahead and ‘play’ the next few bars and see how the price interacts with this long-term downtrend resistance on the logarithmic chart. If we fast forward just a few days, we can see that the price failed to break that downtrend resistance. From a trading theory perspective, this allows us to actually perform a successful R/R analysis by exiting the trade when the price gets closer to the downtrend resistance and locking in profits because we’re consciously aware of an impending drop. Or, if one wasn’t in a position, they could have used this chart to plot/anticipate an early short position to take advantage of the push back. I have written full articles (will be available to those subscribed on the Patreon) about why it is critical to adjust your chart settings when looking back at data several weeks in the past. But for this portion, I felt it better to show people visually how important it is to adjust charts to the logarithmic setting when the situation requires it, rather than explaining verbally. This is a small issue, but one we must point out nonetheless. These are erroneously added to the chart because the bands as they are coded into TradingView’s scripts are not able to give an accurate reading based on the logarithmic chart (which is what should be displaying here). Obviously, this now becomes unreadable. Therefore, the Bollinger’s (as TV calculates it) cannot be relied upon in this situation. I created my own version of these bands using a different MA formula and standard deviation calculation than what the Bollinger’s currently uses. This custom indicator is called the, ‘Zerononcense Bands’ and it is a members/subscriber benefit. As one can see in the chart above, the bands are applied on the logarithmic setting for Bitcoin on the weekly resolution without any distortion to the actual graph itself. Before we dive into this one, let’s go ahead and re-post the original chart so that we can get a good look at how MagicPoopCannon read/interpreted the MACD on the weekly resolution for Bitcoin. Above, he posts ‘MACD Could Be Flattening Here’, which is true. However, this is by no means a bullish signal at all. In fact, if anything, it might be indicative of just how poor Bitcoin’s price performance has been over the past few weeks. In order to understand why I am making these comments, we must understand how the MACD works. The MACD is an oscillator as well as a moving average-based indicator. Therefore, it possesses properties of lagging and leading indicators, making it uniquely useful in charting. Based on MagicPoopCannon’s chart, it seems obvious that the pink line is the MACD line and the blue line is the signal line. This is worth noting so that we can actually interpret the MACD (he fails to do so in his price analysis or even discuss it in the comments below the graph). Conventional trading wisdom states that a ‘buy signal’ is produced when the MACD line crosses above the signal line and vice versa for a ‘sell signal’. 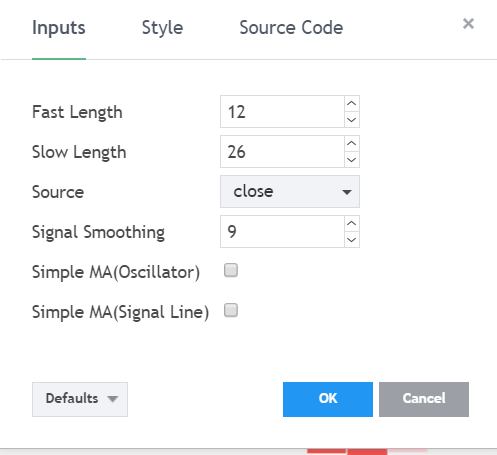 These are the default settings for the MACD on TradingView and just about any other modern trading software that one would use. The numbers 12, 26, and 9 should be more than familiar to anyone that’s used this indicator before. This is an aspect of trading that I often do privately via note taking or simply talking through the charts aloud to myself to seriously conceptualize what the chart readings mean. This is imperative, in my opinion, if one wants to really make sense out of the charts. Given the fact that we know the pink line is below the blue line and we also know the formulas for the two lines, let’s consider what it means when we observe a MACD on the weekly resolution that has yet to produce a buy signal. Let’s start with the MACD line (pink line in MPC’s chart) for a second. Without doing any math, let’s conceptualize what that line is. As we stated above, it is the (EMA12)-(EMA26). 12 weeks from the current week we are in (12 candles back if you’re counting) would land us at October 1st. The price of Bitcoin around that time was $6500. 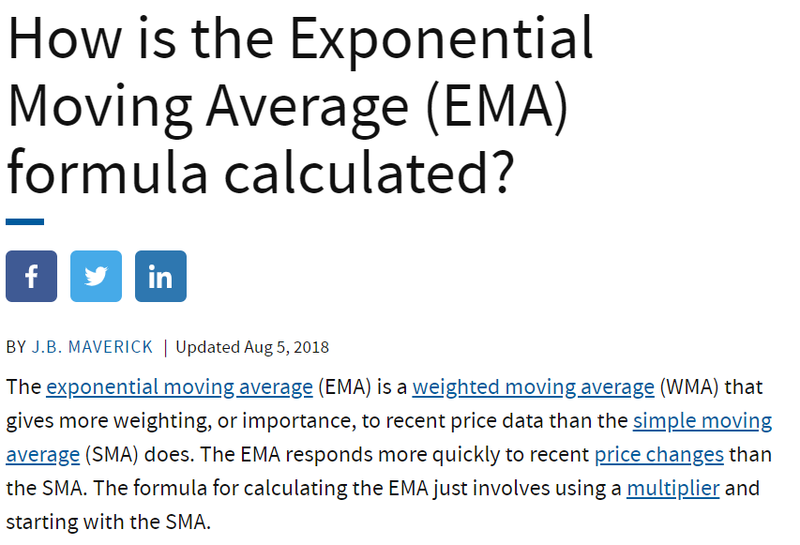 The EMA-12 would be the exponential moving average of the prices from that point on to where we are now (with the heaviest emphasis being on the latter prices). So, we can imagine that’s a lot lower than the EMA-26. If we look back 26 weeks, that starts us on the week of June 25th. Ironically, the price of Bitcoin was roughly the same as it was on October 1st, floating right around that $6k-$6.5k range. However, if you remember, Bitcoin shot through the roof through July and hit a peak of approximately $8.4k before eventually settling back down around the $6k range in August before one last hurrah around the $7k mark (remember the $7.2k resistance we were talking about prior?). Basically, I just wrote out the above to give you all an idea of the conceptual semantics that play through my head when I try to interpret indicators. From the information above, we can surmise that the MACD line should be negative. Given the fact that this is occurring on the weekly resolution, that’s very bearish. Also, if we have done our homework and we truly understand the MACD, then we should be aware of the fact that the flattening of the line, simply means that there is a short-term alleviation in the downward pressure on the price. 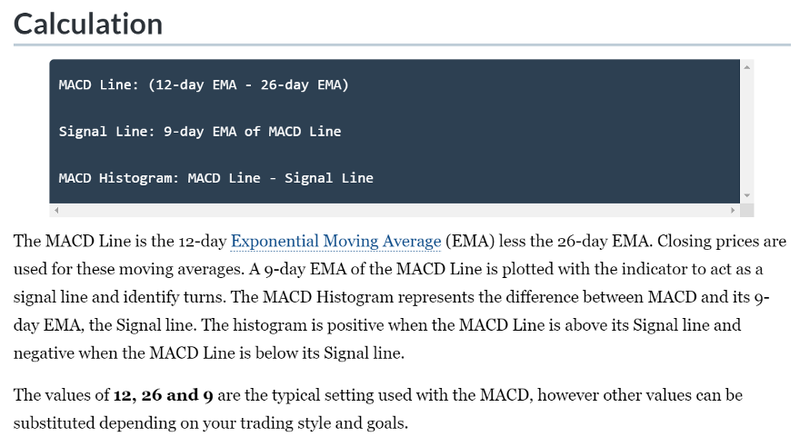 As noted above, the Signal Line (blue line on MPC’s chart) is simply a 9-day EMA of the MACD line. 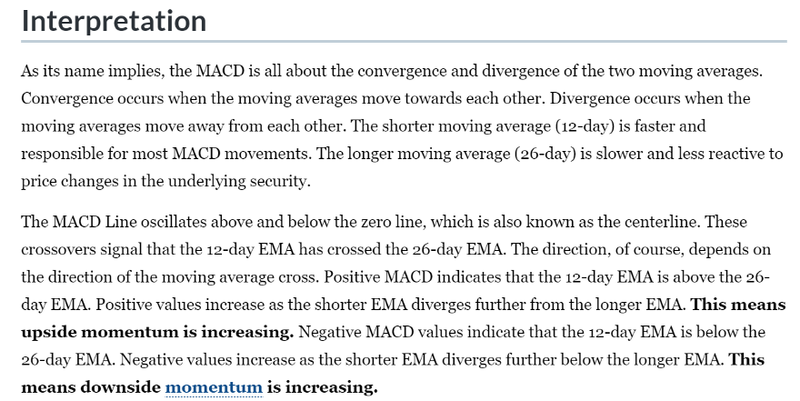 Remember, the MACD is a period-by-period mathematical equation (EMA12-EMA26). Also note that it is always bullish in trading when the faster moving average (the one that tracks fewer periods) possesses a greater value than the slower moving average (the one that tracks more periods). Basic math dictates that if the EMA12>EMA26, then the MACD line (pink line) will be positive (above the ‘zero line’; histogram) and the opposite is true if the EMA26>EMA12. The MACD line (blue line) is telling us Bitcoin’s price action has been miserably bearish throughout the back half of 2018. 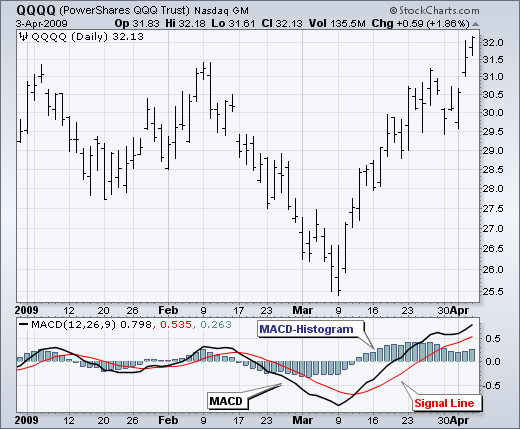 Even with the recent ‘bounce’ in the price after a major decline, the MACD still has not crossed over the signal line. In fact, its still well below it. Since the weekly period has not closed yet (Sunday must occur first), any assessment about the line based on this period’s price data is premature and invalid. As always, I believe that one should never simply assume that I am correct in what I am stating. So, I always post a healthy number of links, references, quotes and research by reputable sources that readers may consult in order to verify whether the information that I am providing is accurate/inaccurate. The above statements, which are commonly accepted trading theory, justify the conclusions that we made about the MACD readings presented on MPC’s chart. They also call into question exactly why MPC felt that this indicator validated a bullish interpretation rather than the bearish one that it clearly shows. Another major oversight on MPC’s behalf is the fact that he did not account for the numerical difference in the MACD’s value from the last period to the one we are currently in. This is something that I wanted to touch upon specifically because traders should never rely on their naked eye to determine angles or indicator value increases/decreases. So, in the previous week, the MACD line specifically held a value of -959.57. In the above picture, we can see that the value of the MACD is still declining. In addition, the statement by MagicPoopCannon that the MACD is ‘flattening’ is unverifiable without applying a rate of change indicator specifically to the MACD line and exploring its trajectory. There is absolutely no logical reason to look at Bitcoin’s MACD reading on the weekly resolution as a sign of impending bull movement. Given the nature of the MACD and its underlying calculations, it is also nearly impossible to make any legitimate forecasts about future price action based on period-by-period movements on the weekly resolution. As mentioned before, the indicator possesses lagging and leading indicator components (moving averages and oscillators), so we’d need to rely on the leading indicator (oscillator) aspect of the MACD to make any type of inference about future price movement. By this, I mean the actual change in value of the MACD line itself (the distance that it travels above and below the ‘zero line’/histogram). Since we are on the weekly resolution, it is more than likely that such visible, confirming movements of the MACD line won’t be detectable until a change in price action is blatantly obvious. Thus, on a time frame as large as the weekly resolution, the MACD should probably only be used as a lagging indicator. “Hi friends! Welcome to this update analysis on Bitcoin , via the BraveNewCoin BLX chart! Let’s get right to it! Looking at the most recent price action, you can see that Bitcoin has found strong initial support on the weekly 200 MA (in purple.) This is very nice to see. In fact, the weekly 200 MA is exactly where the last bear market bottomed. So, based on this, I have been a buyer since the lows around 3200. If you follow me on Twitter, you know that I have been a buyer. I can tell that I have shocked a lot of people, who normally think of me as a permabear, but I have reached a turning point in my view on this market. It has fallen 85% from the highs, and is showing signs of holding around the weekly 200 MA. Now, I realize that the market could go lower, but I am ready to start cost averaging into my long term hold position. I think the bear market is likely to persist for years, and I am fine with that. I have made a lot of money on the way down, and I’m ready to flip my general investment direction in this market. However, like I said, it may fall below the 200 MA, but I will just cost average into my long position at this point. I think the market is at a major discount right now. If price falls to 2000 or 1000, I will load up with even more. I am very optimistic for the future of most of the top cryptocurrencies. So, I am very comfortable with the adjustment that I am making in my investment position. With that said, I do plan on shorting, if the opportunity presents itself, to hedge my long position. For instance, I would probably short a major failure below 3000, but I would not liquidate my crypto position. Just short to hedge, and then cost average at lower prices. That’s my plan. You can also see on the chart that price is near the bottom of the Bollinger band . So we could see a retracement to the middle of the band, which would be somewhere around 5000. Regardless, I believe that the market will move mostly sideways to lower, for the couple of years. During that time. I will be loading and loading and loading my boat. Say what you want. Captain Poop is about to set sail. Bon voyage! I’m the master of the charts, the professor, the legend, the king, and I go by the name of Magic! Au revoir. On an analytical level, there are several things wrong with this analysis. However, rather than digging in quote by quote, I’m just going to excavate the main parts of his write-up that I have qualms with. There is no review/analysis of the MACD indicator in the explainer at all. So, traders viewing this idea are forced to make their own inferences about the 5-word verdict that MPC gave on the MACD in his above posted chart. MPC states, “…you can see that Bitcoin has found strong initial support on the weekly 200 MA (in purple. )”, however, this justification is not supported at all by the chart he posted above. We only see the price interact with the MA-200 once, and it served as a support toward the end of an exhausted, unprecedented bear run that had already depreciated the price by nearly 50% in under a month at that point. Therefore, this assertion is a tremendous overstatement. Perhaps this is redundant, but when MPC states that the price is “showing signs of holding around the weekly 200 MA”, there is again no evidence to suggest that this is the case and MPC fails to elaborate on what specific signs they are alluding to or how these nebulous signs indicate that the price will “hold” around the 200 MA on the weekly resolution. The term, ‘holding’, is also a bit extraneous as well. It appears that MPC is using the idea of the MA-200 being a potential ‘strong support’ (in his words) as justification for a reversal in price and those two ideas are not related at all. One prominent example that shows how/why these two concepts are mutually exclusive can be found by analyzing the price action of Bitcoin earlier this year. Throughout the better part of 2018, traders observed the $6k-$6.5k hold as a very significant support area. However, as we can all plainly see at this point, the fact that this area held as strong support did not signal that a reversal was coming because price failing to break support has absolutely nothing to do with the strength of the impending reversal itself. “Cost averaging” one’s long position if the price “falls below the 200-MA” on the daily resolution is a reckless strategy and does not qualify as a hedge. Hedging (which is a word MPC uses a few times in the explanation), involves strategies of complexities that greatly exceed the trading strategy that MPC prescribed for themselves. Simply entering a long and short position simultaneously is not a sufficient hedging strategy. The trading idea itself is not a complete idea. There are no definitive statements on MPC’s future outlook on the price other than that they have “turned bull” and even this shift in disposition toward Bitcoin’s price trajectory is poorly explained. There are several other major points of analysis that are painfully absent from his trading idea. Me “hating” on MagicPoopCannon. While this is not the case, I can clearly see how someone could come to that conclusion. MPC is the top crypto trader on TradingView (to my knowledge), and I am also a trader that posts ideas on TradingView. My critique is a bit heavy-handed throughout this piece as well. Many may put these facts together and simply conclude that MPC has drawn my criticism because of their rank/position on TV and their notoriety among crypto traders (they are a very well-known personality). Me “bullying” MagicPoopCannon. Some may perceive this piece to be me targeting MPC and/or attempting to publicly defame him or harm his credibility. Again, this piece is fairly hard-hitting and individuals that do not read this article with a rational, mature perspective may interpret this as a crusade against MPC, rather than an informative piece that uses a specific trader’s analysis/idea as a launch point to educate the greater trading community in the crypto sphere. Me “profiting” at the expense of another in the community. Given the fact that MPC is a very well-known trader and that this is a pretty thorough breakdown of the deficiencies in his trading strategy, some may be inclined to believe that I am merely looking to profit via attention/clicks/views by posting a critical review of such a popular figure. I can’t ignore the fact that MPC’s popularity in the community will probably draw more attention to the piece. I will live with these criticisms/allegations. However, I do vehemently deny each. Yes, it is true that I am also a trader that posts crypto-focused charts on TradingView and MPC is ranked substantially higher than I am on TV’s rankings ladder and MPC’s view count outnumbers mine by several hundred thousand (or perhaps even millions), but these are facts that I am comfortable with. I am a trading enthusiast and I am grateful for the fact that there is anybody in my audience. I merely chose MPC as the subject of this critical analysis because I see his charts most frequently. He is not someone that I went out of my way to critique necessarily. My motivation for curating the critique is to educate. In fact, I hope that MPC also sees this write-up (somehow) and perhaps integrates some of the helpful suggestions and educational points into his future trading ideas. It will help them render better ideas. This piece is not meant to be antagonistic toward MPC in any way. I just saw numerous mistakes and misconceptions in his trading idea that I’ve also seen in numerous other charts that have been sent to me in a private message by some of my subscribers/followers/friends in the crypto space. So, I decided to take the liberty of using this critique to not only point out those misconceptions and flaws but also educate by laying out the blueprint for how to correct these mistakes while explaining the pitfalls of making such mistakes. When I began writing this piece, I was thinking about only sending it to those that are subscribed to my Patreon because I really didn’t want this to look like a public attack on MPC. However, as I really started getting into this write-up and dissecting various facets of technical analysis, technical indicators and their usage, I felt that it would be better if this were posted publicly so that aspiring traders could perhaps use this as learning material. In my opinion, there are a lot of people in the crypto space that understand the fundamentals of trading, but they are blissfully unaware of the more nuanced principles of technical analysis and/or they don’t realize how important it is to adhere to these principles religiously. Thus, MPC’s chart was the perfect example, because it allowed me to show how even simple things like switching a chart from ‘regular’ to ‘logarithmic’ or using the correct MA indicators in the correct situation can have a tremendous impact on one’s view of the chart. Perhaps if MPC were aware of some of the concepts that I explained in this piece, his resulting trading idea and general outlook on the future price action of Bitcoin would have been entirely different. The reason why this criticism is not out of place is because one opens themselves up to public feedback and criticism when they posit themselves as a public figure/trader/content creator. By posting this idea publicly on TradingView’s website, MPC opened themselves up to community feedback, which will inherently include praise, criticism, skepticism, and discipleship for any major, popular figure. This is something that I hope individuals walk away remembering. Since MagicPoopCannon is so popular on TradingView and their ideas are seen by so many eyes, I felt compelled to create this piece. The reason why I felt compelled is because I genuinely believe that while MPC is probably a good person (I don’t know them or anything about them), there are some serious trading fundamentals that they do not understand. Others that follow them or their trading ideas that do not have enough independent trading knowledge of their own may not realize this as well. This is dangerous because, due to his rank on TradingView, many may be inclined to assume that his status validates his expertise, and this is not the case. I am not saying MPC is an idiot, scammer, or anything else, but their lack of adherence to fundamental trading principles and concepts has rendered incorrect trading analyses more than once and probably screwed them over as well as those that have followed them and accepted their trading ideas without question. Overall, it is my hope that individuals will walk away from reading this piece with a greater knowledge about trading overall. I hope that some of the trading ideas, concepts, points, situations, and fallacies stick out prominently in the heads of readers and assist them in the future as they began to curate their own trading strategies and ideas. Of course, the contents of this article is by no means a comprehensive overview of everything one should know about trading but I sincerely hope that I was able to provide solid insight. I also hope that I was able to show that there is a bit more to technical analysis than what meets the eye and that T.A. is not some mystical, fortune-telling process by a bunch of snake oil salesmen (not saying that MPC is at all) trying to steal your money. Finally, it is my hope that this article will provide the most benefit to those that have tried to T.A./chart in the past or have followed ideas from other traders and ended up walking away discouraged/dejected because they’ve lost yet another trade or they were ‘wrong’ yet again. I want this piece to shine as a beacon of light to show you that it may not be a deficiency in T.A. itself, but rather the knowledge you possess on how to T.A. Of course, this will be followed up with another one of my regular Bitcoin price analyses (among an assortment of other coins), and hopefully, some of the explanations/ideas/charts that I post begin to yield ever-increasing benefits as we traverse into the new year.